Gray & white striped knitted hat with pom pom on top, "Butler" embroidered in purple and white. 100% acrylic. Black & white wide striped Nike knit beanie, "Butler" embroidered in white. 100% acrylic. One size fits most. Purple & white wide striped Nike knit beanie, "Butler" embroidered in white. 100% acrylic. One size fits most. Nike dri-fit black hat, Grizzly power head embroidered in purple & white on the front. Back adjustment strap for the perfect fit. 100% polyester. Nike knit beanie, "Butler" embroidered in white on the black hat and in black on the gray hat. 100% acrylic. Very warm for cold weather. Nike Black Therma-Fit Beanie hat with purple "B" and Nike swoosh on front. One size. Black and grey beanie with "Grizzly" logo / repeating "Butler" on front and Nike swoosh on back. 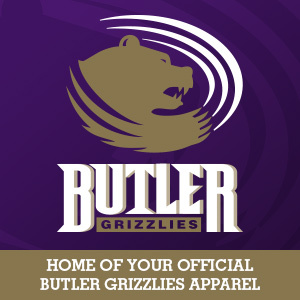 Branded Nike Purple Campus Cap "Butler Grizzlies"
Nike purple cap with white "Butler Grizzlies" imprinted on front. One size fits most. Nike (dri-fit) purple and white cap with white "B" on front bill. One size fits most. Nike "Youth" ball cap. Purple/White with "Grizzly" logo on front and "Butler" imprinted on back. One size fits most youth.